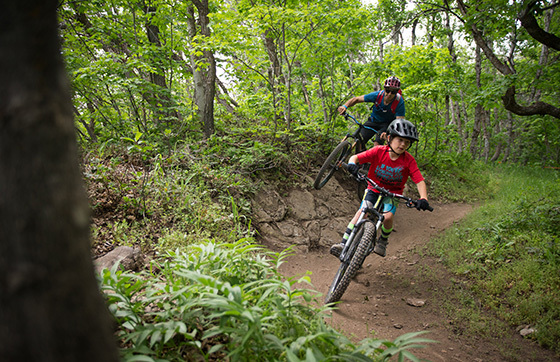 “Less driving, more riding!” shouts seven-year-old Milo Porter as he carves through the final turns of a singletrack that leads back to the parking lot of Utah’s beautiful Sundance Resort. Evening is quickly approaching, and there’s one more sweet ribbon of trail everyone wants to hit before packing it in for the day. Someone suggests that they load the bikes into the truck and drive the steep, paved road up to the trailhead—but Milo isn’t having it. It’s impossible to dismiss his enthusiasm, and the group all agrees to ride on. “It always feels more fun when you earn it!” he says emphatically as he begins the climb, an exposed series of small alpine switchbacks that are already making lungs burn. As the road steepens and he pushes harder on the pedals, there are no complaints and no regrets from Milo, just the uninhibited enthusiasm only a young child can possess. 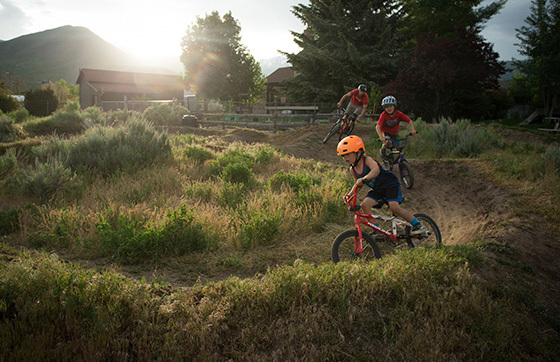 This may seem like extraordinarily rare behavior for a seven-year-old, but it’s less surprising when you learn that Milo’s dad has been a professional mountain biker for the past 15 years. So while his positive attitude and sense of adventure are remarkable, it’s not by accident that Milo turned out this way. Eric Porter spent most of his childhood on two wheels, first ripping around his Louisville, KY neighborhood on a BMX, and later exploring the endless network of mountain bike trails surrounding his hometown. By age 15, Eric was working in a local bike shop and regularly competing on weekends. In his final year of collegiate racing, he won national championships in both slalom and downhill. Not long after, he was featured on the cover of Flow magazine, and his career took off. 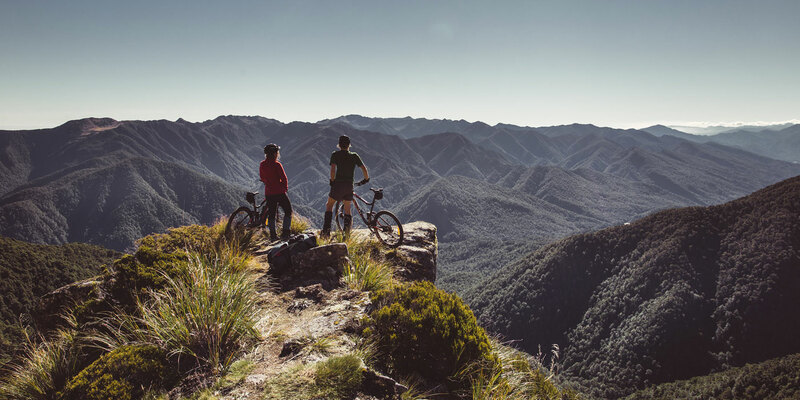 Over the next several years, Eric found himself on the podium in just about every type of contest imaginable: freeride, slopestyle, downhill—if you could do it on a mountain bike, Eric was game. Then in 2011, Eric sustained a serious concussion while trying to land a tailwhip over a 45 foot canyon gap. Unable to compete for several months, Eric had time to reflect on what he truly enjoyed about the sport, and it gave him a new perspective. 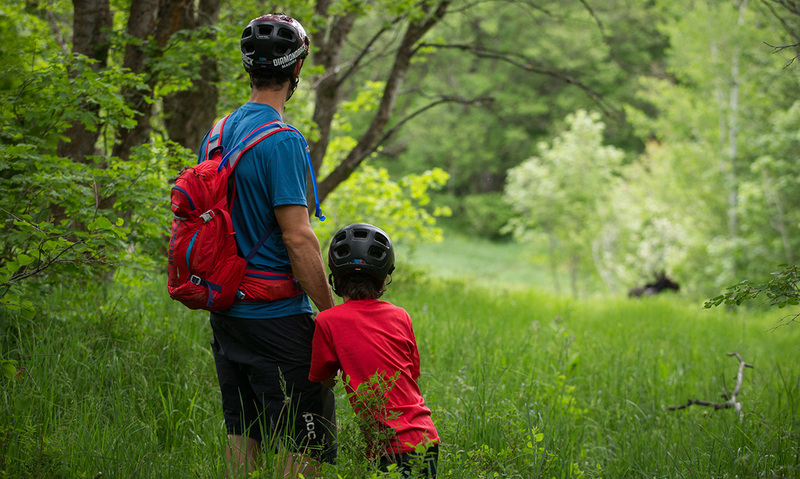 With his wife, Megan, and a two-year-old son at home, Eric decided to stop competing and focus instead on the backcountry riding that brought him so much joy. He knew that sharing those adventures with his family would be a key element in his transformation. The trails at Sundance are primed and tacky. After an unusually wet winter, spring has arrived and the mountain forest is lush and green, almost jungle-like. 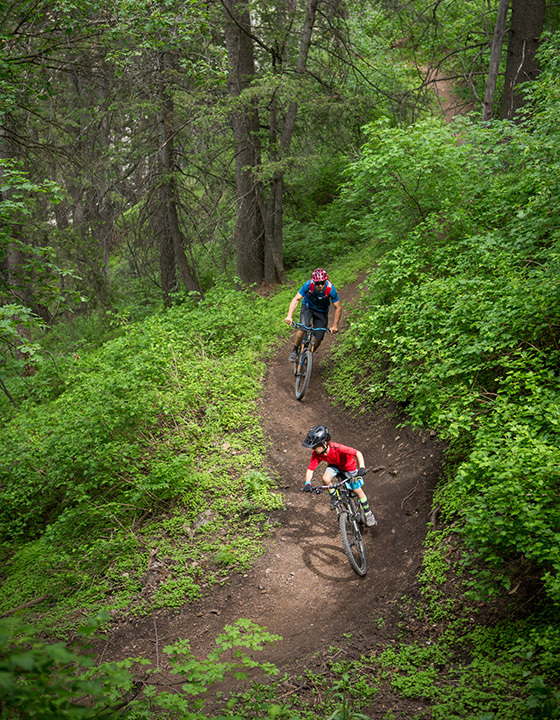 Eric and Milo cruise through tight, shaded turns linked together by fast straights with small root drops and loose rocks, hooting and hollering as they go. 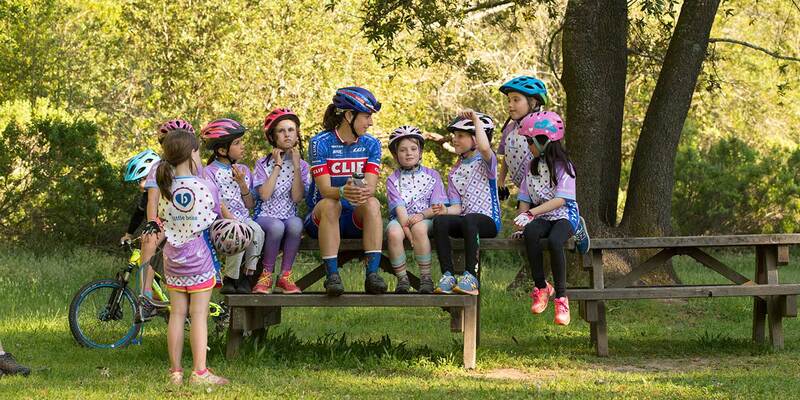 The speed increases as the trail straightens out, and it’s only when the group stops to skip rocks in a small pond that they’re reminded that this ride is being led by a 1st grader. It’s fun to listen to Eric and Milo talk as they ride. As good as young Milo is, he is very aware that his dad worked hard to develop his own skills, and he knows he has much more to learn. “Make sure you go into the corner on the outside and then cross over to the inside,” says Eric as Milo overshoots a turn. “You’ll go faster that way.” They laugh and tell jokes, often sounding more like old friends than father and son. It’s obvious theirs is a special relationship, a tight bond forged through countless hours playing together in the woods. 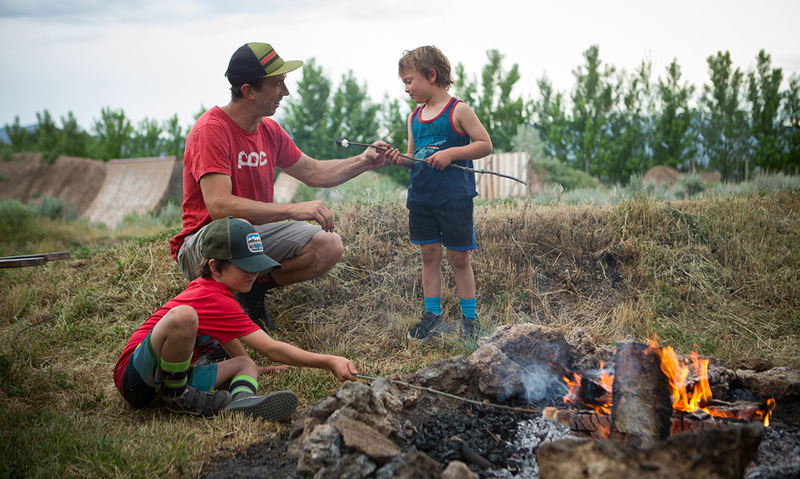 Later that evening, after completing an admirable shred session on the Porters’ expansive backyard pump track, Milo and his brother Owen seem like any other young kids, roasting marshmallows on the fire as Megan coaxes them inside to get ready for bed.